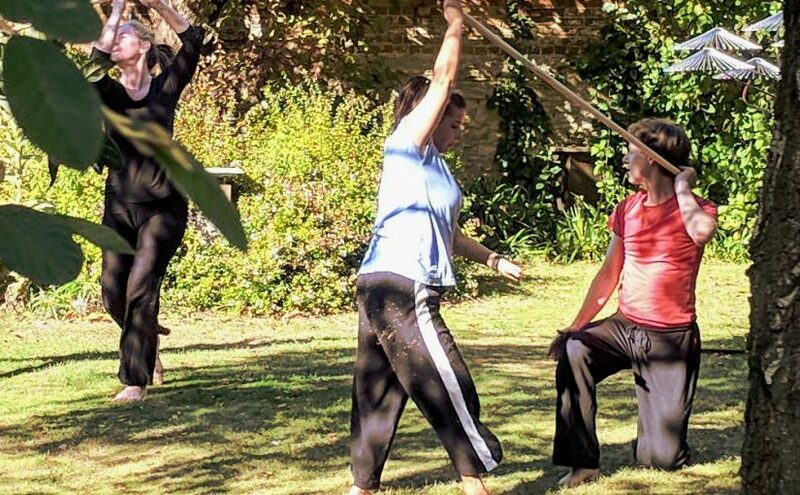 The idea for a dance in the Turrill Sculpture garden – which is the garden of the Summertown Library in Oxford – came from an organisation called Fairplay Oxford, who campaign on climate justice. A dance was certainly appropriate for the sculpture garden at that time which was hosting an exhibition of kinetic sculptures by artist Richard Cressell called ‘The Art of Movement’. Our stage was the lawn of the Sculpture Garden – elliptical shaped with bushes, trees and shrubs in the borders softening its edge. The four dancers: Tamsyn Stanton, Stacey Seigel, Sonia Dacamara, and me were accompanied by cellist Josie Webber. We’d created a score for the Garden Dance the previous week at a composition workshop. One of the features of the dance was the use of 1.2 meter wooden poles. These were lines moving in space, an idea partly inspired by the abstract paintings of Kandinsky. Garden Dance: Dancers: Stacey Seigel (left), Tamsyn Stanton (middle), and Andrew Wood. 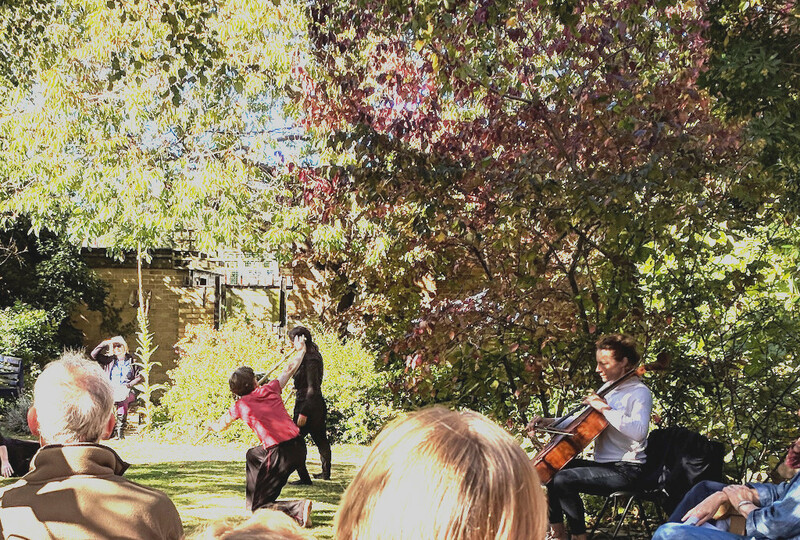 Performed at The Turrill Sculpture Garden, Oxford on 29 September 2018. We mostly kept to the score in our performance of the Garden Dance. Although at one point, we were supposed to have two duets dancing with one wooden pole each but infact there was one duet with no pole and another with a pole. We kept to the scheduled performance time too: 15 minutes for the dance, and with no cues from a timekeeper nor Josie our cellist! 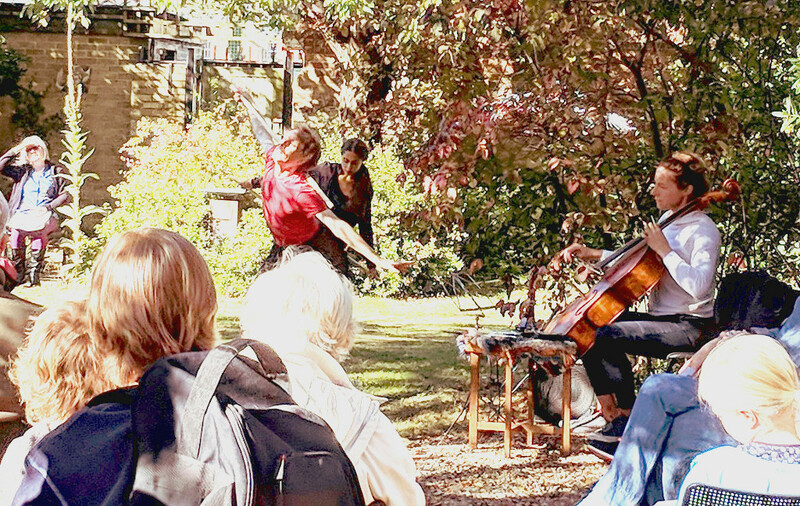 Garden Dance: Dancers Andrew Wood (left), Sonia Dacamara (behind, right) were accompanied by cellist Josie Webber. 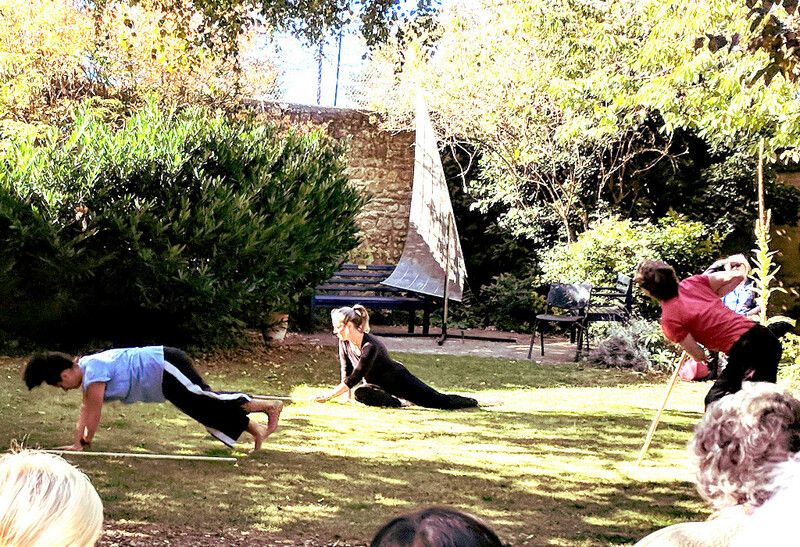 Performed at The Turrill Sculpture Garden, Oxford on 29 September 2018. As we danced then the intersection of lines from the poles, human bodies and the linear structures in the garden – mostly trees and plants – became apparent. We even tried movements – lifts – which we’d not practiced in the composition workshop. It’s difficult not to read a narrative into the dance – particularly as when two dancers both had wooden poles and they appeared to be sparing in a sword fight. Perhaps that was war? What then of Stacey and I, who were dancing contact improvisation – without sticks or at least not fighting with them – like the others. Peace perhaps?Love maybe?! Love and war? At the beginning of the dance we’d scripted creating a chain and counter-balancing with the four sticks we were carrying. Then we’d break the chain and move very suddenly, almost spilling onto stage. (Note: this is not shown in the video above which starts about 3 minutes into the dance.) Was this an allegorical reference to the breaking point of human activity and its environmental impact? We’d not intended it to be so – we simply wanted an entrance which linked us all, and which brought us on stage; out of the bushes which had obscured us ‘backstage’. Similarly, at the end of the dance we created a plane from the four sticks – lifting them above our heads and poking our hands through the spaces. Perhaps this was rising sea levels? Infact, this particular movement was a discovery at a Creative Lab of Oxford Dance Forum prior to the composition workshop. The people attending were concerned about injuring themselves and holding the sticks aloft prevented it! I noticed that it created a plane or surface. To exit the dance, we carried one of the dancers – Sonia – off stage. Was she representing a climate change victim? Not especially, it was simply an idea for using the sticks in contacting our body from the composition workshop. It was a really delightful afternoon, couldn’t have been better. Please give our very grateful thanks to the other dancers and the cellist. I loved the garden dance, even having to rake the lawn of leaves and fallen twigs at the beginning made it very special. Featured photo/top image: Dancers Tamsyn Stanton (left), Stacey Seigel (middle), and Andrew Wood (right) on stage at the Turrill Sculpture Garden, Oxford on Saturday 29 September 2018. All photographs are from Helen of Fairplay Oxford.